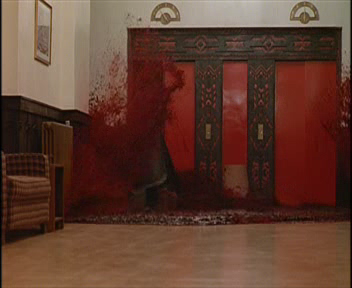 Occupied Elevator from The Shining (1980)--There were plenty of disturbing images in this Stephen King classic. But no other scene still has audiences today frozen in fear as they watch the elevator of the doomed Stanley Hotel literally hemorrhage on the big screen. You don't know whether to run, grab a paddle or scream. High Bar Horror from Final Destination 5 (2011): We all wanted to write off this fourth installment to the teen cult classic horror franchise. But director Steven Quale upped the ante with a 3D effect, which turned a usually harmless gymnastics routine into a crumpled pile of flesh in one sharp take. Like the swan songs of all the victims in Final Destination, there's a series of threatening events that lead up to their ultimate demise, but you never know which one it will finally do them in. This scene, which is no exception to the rule, by far trumps even the freakiest deaths in the entire series. And that's saying something. 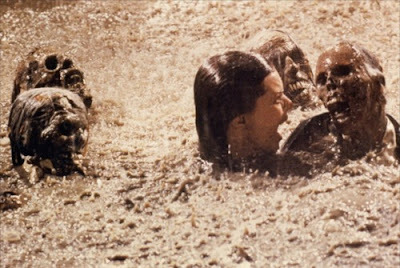 Unfinished Cemetery from Poltergeist (1982): Just when you think all the terror is over, Carol Ann is back safely out of the TV and the family is getting ready for bed, Diane (JoBeth Williams) has to rush to ward off another ghoulish act away her children. But not only does she have to contend with a neverending hallway to their rooms, but when she tries to go back into the house from the back way, she falls into their dried-up pool....where corpses have lying underneath rotting only to submerge at this very inopportune time. In patches of mud. During a downpour. At night. This scene is pitch perfect, and totally unexpected at the very end of the movie when you think all the thrills are over. Backwards SpiderWalk from The Exorcist (1973): Audiences knew there was something a little off about the precocious teenager Regan, who not only wet herself in the middle of a dinner party but had been showing other signs of cuckoo behavior earlier. But Ellen Burstyn was a master at stirring up fear in the audience but the sheer widening of her eyes as all the color ran out of her face. That was captured best when she saw her little girl galloping down the stairs backwards spilling blood out of her mouth. It's still a frightening scene. High Definition TV from The Ring (2002): Noah (Martin Henderson) receives a random VHS tape that looks blank. He pops it into his VCR and he's curiously captured by the randomness of a young girl climbing out of a dark well. With the girl's stray dog hair and soaking wet flannel pajamas, Noah is transcended in fear as the girl makes her way toward the screen. Closer. Closer. As she lays her hand on the screen and walks out of the TV into Noah's living room, audiences are literally at a point that they want to scream and cannot utter a sound out of sheer shock over the possibility of a frightening movie coming to life in their own living room. Brilliant. The Crucifixion Scene from Carrie (1976): It's no argument that the ultimate awkward teenage girl Carrie's mom (Piper Laurie) was a little....weird. But she was in rare form this evening reciting bible passages and vowing that her daughter wouldn't become the tainted, disgraced woman she apparently did. After Carrie runs amok at her prom, setting her school on fire and all, she tries to wash away all the night's events. But her mom sees the only way of truly cleansing Carrie is to kill her. She tries to stab Carrie, but Carrie retaliates by telekinetically launching nearly every knife in the house at her mother. She's hung in perfect crucifixion stance, but what's creepy about it is that she's almost very peaceful about her own death as it's happening. The final look on her face, which lies gently resting on her right shoulder, threatens that she could actually be more frightening after death. Awesome. That shot from The Shining amazed me so much...I'm not sure why. Oh, and Carrie! Ah, I love that movie! 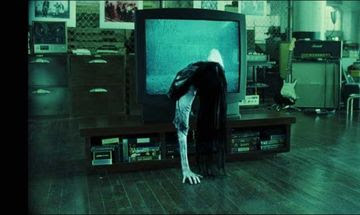 The scene from The Ring almost made me stop watching television. Scaaaary!! Some wonderfully haunting images there. One that always gets me is the werewolf transformation in American Werwolf In London, and also the scene in Cronenberg's The Brood when you see the mother with a womb sac on the outside...very weird.